All the volume controls I am familiar with are variable resistors. Could you use the volume control out of the parts radio chassis? What am I missing? That's what I was wanting to do, but do not know how to do that. 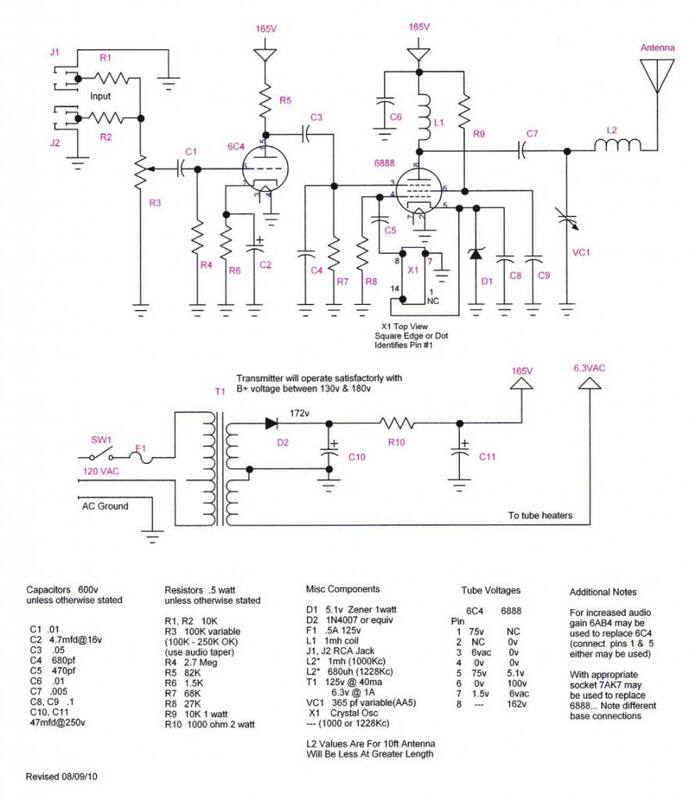 Perhaps Google up some schematics of tube radio or amplifier volume control circuits to look at...just mind the voltages and stuff, and do not run DC through the volume control. Typically, the audio is coupled through a DC blocking capacitor to the potentiometer, and the leftover audio goes through another capacitor to the grid of a preamplifier. Typically again, the potentiometer shunts a variable amount of the audio AC voltage (only) to ground. Buy an audio curve potentiometer, not a linear curve one. 500K ohms to 1 megohms are common values for tube equipment. So far every schematic I've looked at requires an IC and is 1 channel. I'm not trying to buy parts. I wanted to use what I had on hand. I have some tubes too, but only a few select ones. I figured it would be simple and not require any power source. After a quick inspection of my parts chassis, it looks like I only have single gang pots and they are all in the mega ohm range. So it doesn't look like i'm building a volume control any time soon. I missed that is was solid state. The volume control would likely be much lower, like 5-10K. Ragwire, there was nothing I can see that specifically mentioned solid state. I assumed tube. What do they say about assuming? Tom's on it. On the left side of the image the 6eu7 tube has circuitry on pins 8 and 5. The 10k,1m and 100k volume have all been added. I usually and this circuit and then add a epoxy cap to the input of it. I think a .05 cap maybe. The control is from radio shack and its a dual 100k volume control. There are all types out there but this one is the last one I used. One side goes to ground, the other side goes to the AVC line, (look for a 1 meg in series and a.0005 mfd cap to ground)), then the wiper goes through a .005 mfd cap to the AF or or control grid of the Det/AVC/AF tube, like a 12SQ7.